Palestine Association for Children’s Encouragement of Sports (PACES), is a UK based charity established in 2006, with the aim of providing healthy, structured after- school sports programs for Palestinian girls and boys ages 7-16 years Living in refugee camps and most marginalized and vulnerable areas in Palestine, Jordan, and Lebanon. From March to November every year, children are granted an escape from being idle on the streets, or in their homes; an escape that is fun, healthy, and one that encourages participation and inclusion. 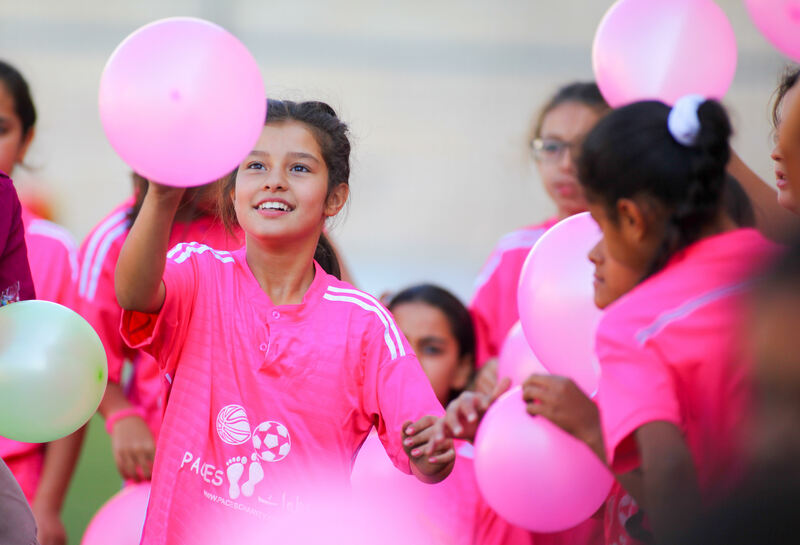 Since its establishment, PACES has reached out and served over 30,000 children, 2,000 young female and male coaches and assistant coaches, and over 100 local sports clubs and other community based organizations. All programs promote gender equality, and have successfully reached and maintained a 50% female participation rate. Through its core sports program, PACES provides children with multiple educational benefits to help them thrive in their own communities. The program also encourages discipline and cooperation, and builds their confidence and self-awareness. In addition, PACES offers non-sport activities to enhance the children’s social development through partnerships with local and international NGOs. The non-sport activities include awareness sessions covering several essential topics such as health, safety, and hygiene among others. To attain a wider impact, PACES builds local capacity by training and hiring leaders in the local communities as coaches to deliver the sports programs. Coaches receive training in multiple areas, and acquire a set of skills necessary to enhance their employability in the job market. PACES also partners with local clubs and sports centers situated in marginalized areas, which facilitate the delivery of program and outreach to the target beneficiaries. – To enhance children’s life skills through sports programs and educational activities and empower them to become active citizens within their communities. – To enhance employability skills for young female and male coaches. – To improve the capacity of local partners to become part of the development of sustainable communities. – To provide equal opportunities for both genders in sports.